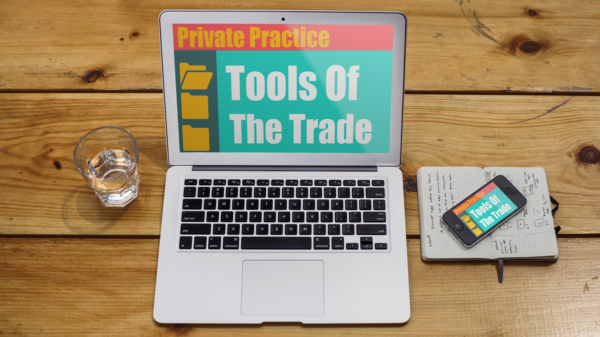 It’s easy to get bogged down in the technology that we use for our private practice. So many distractions. What works? What’s worth my time? What will save me time and make my life easier? Below is a list of tools that I use every day. 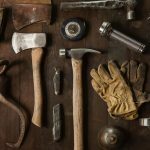 It’s not a complete list, rather a list of the most important and useful therapy business tools that I use. 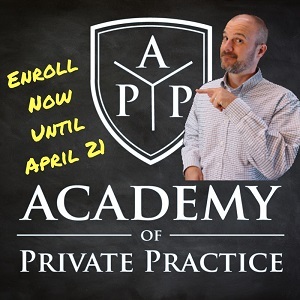 Please leave a comment below and let us know what tools help you with your practice. This article was created using Evernote. I’m sure you’re like me and have brilliant ideas throughout the day. You come across interesting articles or read a page in a book that you want to save. Maybe it’s a crafty craft or a recipe. Perhaps an idea for a business or a product. Whatever brilliant thought or idea you have, Evernote gives you superhuman brain power. I like to think of Evernote as a large file cabinet. In the cabinet, you can create and store as many notebooks as you want. In each notebook, you can create a note that pertains to the subject of that notebook. Each note is sort of like a Microsoft Word document. In a note, you can store typed words, pictures, documents and audio. You can also upload a document to a note. You can tag a note with a phrase so you can aggregate and find similar information. You can share individual notes or notebooks for collaboration. 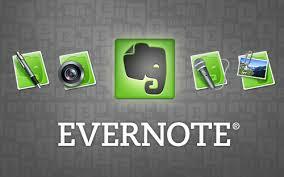 Evernote is a cloud-based service. This allows you to have access to your saved information on any device. I use it all day every day. 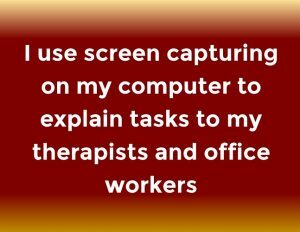 I use screen capturing on my computer to explain tasks to my therapists and office workers. It saves me a ton of time. If I need to explain how to do a task I just point them to an SOP (Standard Operating Procedure) that I created. I wrote an article on how I do that HERE. I use Snagit for screen capturing. Another option is PicPick. If you want to take video screenshots I suggest Screenflow for Mac and Camtasia for Windows. I use both of these services but Dropbox is my go to tool for cloud based storage. You might also want to look at Amazon Drive. Dropbox and Google Drive give you a free amount of storage up to a point. If you’re storing health records you will need to secure your cloud storage. Sookasa works with Google Drive and Dropbox for HIPAA compliance. Amazon Drive talks about HIPAA compliance HERE. I use email as a reminder and to-do task manager and Boomerang gives me that power. When I send an email and I want to be sure to receive a reply within a certain time I can set a Boomerang on it. If the person does not reply within the set time the email gets sent back to me. Boomerang also has a pause feature which helps me control the flow of my email. Boomerang reminds me to either try again or ramp up my efforts to contact that person. Boomerang also has a setting to send an email at a future date. Simply write the email and click on the “Send Later” button. I have used a few different to do list apps and software. 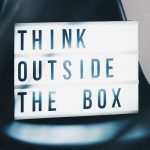 Todoist is my latest attempt at managing all that I need to do and unlike Bono, I think I have found what I have been looking for. I have also used Evernote as a to-do app and it works pretty well. 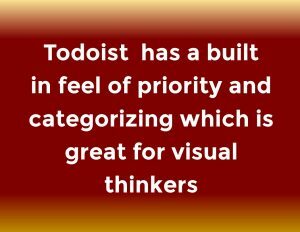 Todoist has a built in feel of priority and categorizing. It has color coding. For a visual thinker, color coding is, as they say, the cat’s meow. Todoist integrates with Gmail and Google calendar. It also integrates with most other email calendar tools. Again, Google is the big boy when it comes to most things tech. I have used Firefox, Internet Explorer and Safari, but I keep coming back to Chrome. If you are worried about Google following you around and knowing what you’re up to, Chrome may not be for you. If you like having all the power of the Internet at your fingertips like a Jedi Master then tolerating Google’s creepiness is worth it. Chrome has extensions that you can download which sort of work like apps on your smart phone. You can also use Android apps on your Chromebook laptop. Chrome internet browser gives me almost super human internet powers. I read a lot of articles. Well, let me re-phrase that. I skim a lot of articles. I bet you do too. The best way I have found to aggregate websites that I like is Feedly. I choose which websites I want to follow and then Feedly goes and gets articles from those sites. I can categorize by subject. I have a politics subject, therapy, local, Catholic, philosophy, marketing, and the list goes on. You can even set up a Craiglist saved search to feed into Feedly. Within Feedly I can save articles to read later. I can share an article on social media. Feedly helps me keep up with websites that I may forget to visit otherwise. Feedly offers a free and premium version. These are social media managers. I use both of these but I pay to use Buffer. Hootsuite has a reader that allows you to see all your social media feeds at the same time which is pretty cool. I have found Buffer to work a little better for me but both of these managers are good. If you have money to spend you might take a look at Edgar which is pretty powerful. I use spreadsheets to help me run my practice. 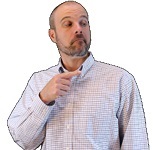 Have you checked out my Client Tracking spreadsheet? It’s what I use in my practice every day and you can get it for FREE. Sure you can use Google docs, Libre Office or Open Office but you get what you pay for. I would not be able to run spreadsheets to their fullest capacity on those free versions. I also like Microsoft Word. I created my ebook, Start and Run a Therapy Practice using, Microsoft Publisher. I used to purchase the entire Office suite on CD but now Microsoft has gone to a membership type of payment. If your practice is not using a paid EMR it should if it continues to grow. I used spreadsheet notes and homemade databases to track billing for years. This would have worked had my practice stayed small. 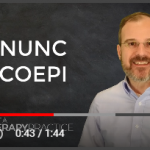 My practice now uses Clinic Source which is geared more toward pediatrics. Another good pediatric EMR is Fusionweb. If your treating adults I suggest you take a look at WebPT which is not just for PT’s. I sat in on a demo at their Ascend private practice conference. WebPT is working on some reporting tools that blew me away. If you end up checking out any of these be sure to tell them I sent you. 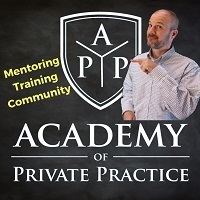 Your practice website is your second best tool to get new clients. Your first best tool is you. WordPress allows me to create a website how I want to and doesn’t lock me into a template. If you do have a website with another tool don’t feel bad. Having a website is the key. I just prefer having a little more control and freedom for creativity. You will need to purchase a website domain name and a website hosting service. I personally use Inmotion. You can also check out Bluehost or Godaddy. I would love to know what you use that should be listed here. Leave a comment below and you will be doing us all a favor. If you benefited from this article please hit one of the social media share buttons.